THERE’S no denying we love SEMA. It’s probably the most unique automotive industry trade show out there – and it’s mostly because of the engagement the event has with car brands – lots of major car brands, and their partnerships with after market modifiers. Even more unique is the fact SEMA is not open to the public. To be held in Las Vegas in November, the show will attract more than 60,000 trade-only visitors, drawing the industry’s brightest minds and hottest products to one place. Last time round we bought you stories on a number of heavily modified vehicles (check them out: Know our blood type?, Steel phoenix rises, Super genetics). This time round, the first of those heavily modified vehicles has now been revealed – a 2016 Hyundai Tucson that pumps out a whopping 500kW. Partnering with the legendary Bisimoto Engineering for the fourth year in a row, to create that company’s first ever modified SUV, the ‘Brute Ute’ will be revealed at SEMA on 3 November. Utilizing Hyundai’s 2.4-litre “Theta-II” power plant as the starting point for the build, similar to last year’s Sonata, Bisimoto mated strengthened internals with fast-burning flex-fuel, a high-boost turbocharger and an upgraded engine management system to put down more than 500kW to the wheels through a 6-speed manual transmission. 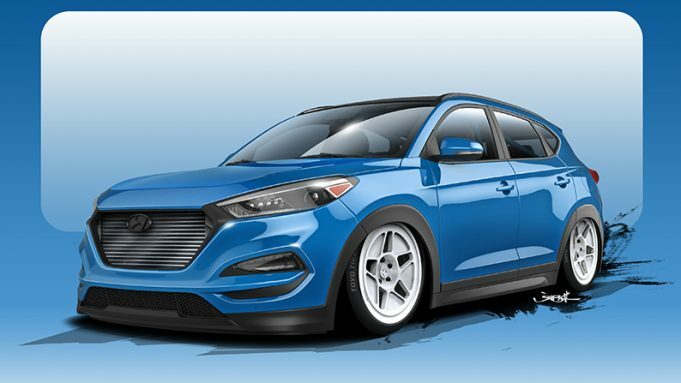 This rendition of the Tucson was built with the ultimate vision of packing world-beating performance and technology into a brand-new, unexpected vehicle platform. “The Tucson was the perfect platform for this year’s build, offering me the opportunity to captivate a wider audience by tapping into the growing popularity of the SUV market,” said Bisi Ezerioha, owner and chief engineer, Bisimoto Engineering. Complementing the absurd power figures, Bisimoto gave the exterior a very clean “street fighter” look, riding on custom air-ride suspension, white five-star race-spec wheels and sticky, R-compound rubber. A custom roll cage hints to the vehicle’s performance credentials, and the signature Bisimoto look is rounded-out with the elimination of the front grille, replaced with a huge intercooler to cool the incoming air. Korean car maker SsangYong has heralded the new year with the global unveiling of its all new long wheelbase Musso dual cab utility, set to build on the acclaimed Musso ute launched in Australia in December.